2007 saw a very bad summer for British farmers. June and July received unseasonably large quantities of rain and resulted in widespread flooding. The crop yields were drastically affected and the possibility that this might happen again in the future helped to inspire some very interesting research. Researchers from the universities of Nottingham (UK) and California, Riverside (USA) have been looking into ways to minimise the damage caused by flooding. As flooding is a worldwide problem affecting millions every year, any damage limitation would be of huge importance to the world's population. The researchers looked at the mechanisms involved in plant cells when they are deprived of oxygen. Julia Bailey-Serres, of UCR, explained that when a plant cell doesn't have enough oxygen it cannot form the molecule that plants use to store energy, Adenosine Triphosphate (ATP). Without this energy the plant needs to break down stored sugars to sustain growth. Their research looked into the way plants switch between the two modes. Bailey-Serres has been working with genes found in submergence-tolerant varieties of rice and one in particular, SUB1A, has led to varieties of rice that can survive the inhospitable environments of monsoon floods. The professor said, "We think that SUB1A's ability to evade destruction by the protein turnover mechanism under normal oxygen levels may allow it to provide its benefit to submerged rice plants,"
The recent research has found proteins in other plants that are similar to those found in the resilient rice strains, but they differ in that when oxygen levels are normal the SUB1A-like proteins degrade. 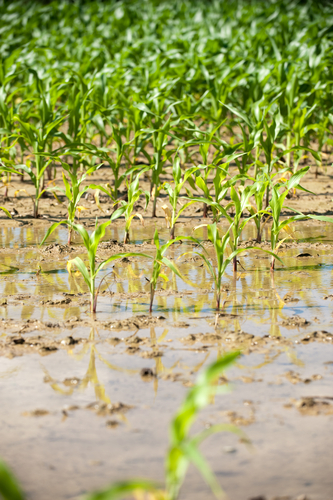 Understanding this difference and the mechanisms involved in the protein turnover will allow targeted manipulation of future crop varieties and possibility of new, flood resistant plants. Paraphrasing Professor Bailey-Serres, the preliminary studies show promising results and although there are many questions regarding the protein turnover mechanism that need to be answered, there is no reason why this work cannot be extended to bring the benefits to other crops. The benefits to developing nations hit regularly by flood-caused crop destruction such as Bangladesh or India could result in dramatic improvements to income and stability in those areas.